"This is actually yesterday's news," says Rolf Sandvik, CEO of The Fjords DA. Vision of the Fjords was designated the Ship of the Year at the world's largest shipping trade fair in Hamburg last year. The award went to the hybrid ship, which runs partly on electricity, due to its mix of environmental awareness and comfort. The ship turns off its diesel engines and manoeuvres into the most vulnerable areas of the Nærøy Fjord using only eco-friendly electricity. 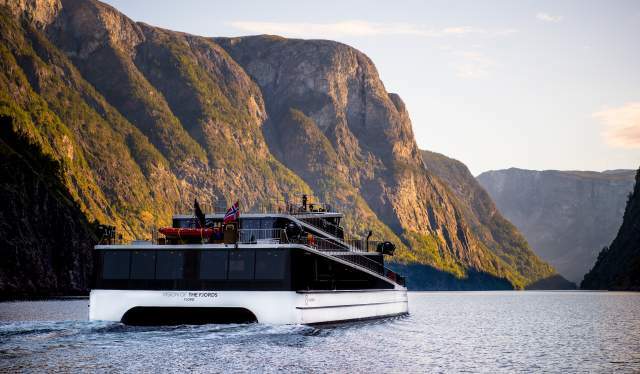 Therefore, neither exhaust or noise ruin experiencing the nature in the inner part of the fjord, which is a part of the Sognefjord and defined as a UNESCO World Heritage site. The Nærøyfjord is, according to the UN, one of the world's most beautiful areas with glaciers, huge waterfalls, sea mammals and submarine moraines. On board the Vision of the Fjords, the tourists are transported silently and gently and get even closer to the beautiful nature. However, as soon as the first of April next year, a new boat will be ready for service, and he promises that it will be fully electric. "The development process is moving very fast. If we had had the opportunity to go fully electric two years ago, we would have done it. We're taking a big chance on Future of The Fjords, as this entails an additional cost of NOK 44 million on our part, and we're happy that we have Enova and Innovation Norway on board with us," he says. 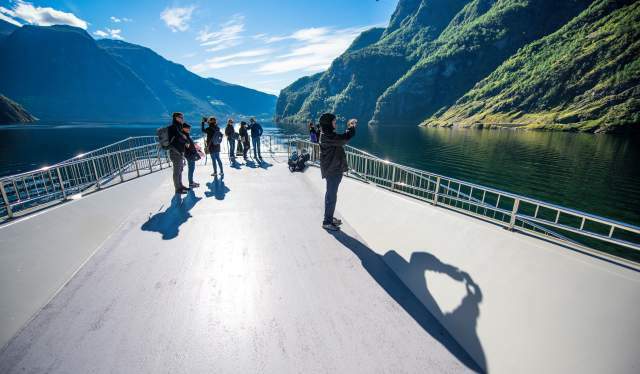 Sandvik believes that tourists are becoming increasingly aware and making environmentally friendly choices. There has occurred a shift in the market, where nature-based experiences and sustainability go hand in hand. This is important because the cruise tourist market is wholly commercial, with no state funding schemes. Thus, it is the tourists themselves who dictate which operators will survive. "The competitive edge today entails the cheapest possible vessels and almost exactly the same ticket price. But we strongly believe that travellers choose operators with the lowest emissions. The dream is that all of Norway will become a country for zero emission experiences, and be sustainable in environmental terms," he says. Sandvik is currently working to find solutions aimed at stopping sewage emissions from ships out in the fjord. He also has contact with the vendors who are developing a floating battery pack that provides power to the ships. That way, they will not be dependent on the local power grid to as great a degree as today. "Infrastructure is often the constraint. If we must recharge via the local power grid, we'll max out on capacity, and that's not good for the people who live there. With a dedicated floating battery pack, we can expand service to places we would not have believed were possible. We will soon have the possibility of operating in Geiranger Fjord on a fully electric basis, for example, where until now there has not been enough existing capacity in the power grid," he says. "This also means that the authorities can avoid the need to expand capacity in the power grid all over the place. We expect that this technology will also be of benefit to others. It will revolutionise the market with more charging points for electric cars, electric bicycles and electric buses all over Norway." At the Scandic Fornebu hotel, guests can now borrow electric bicycles for free, which is a first in Norway. At Hotel Aak in Åndalsnes, you can borrow electric bicycles for free and bike up the Trollstigen road and ski down the mountain. The hotel also has a free charging station for electric cars. 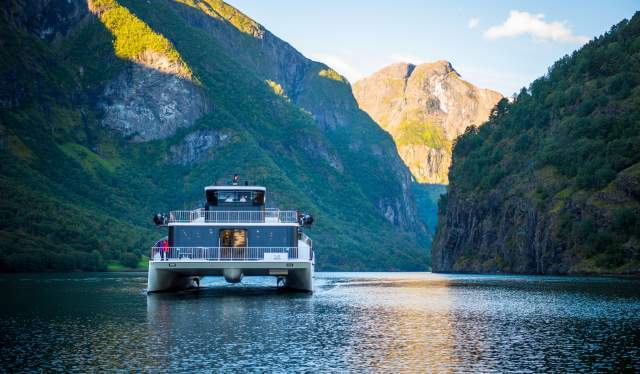 Fjord1 is a pioneer in the area of electric ferries, and has hired the Norwegian company Fjellstrand AS to build a fully electric passenger ferry for 296 passengers. The ferry will be made of aluminium, which is 60 percent lighter than steel. Aluminium is a sustainable material that does not emit pollutants, and it can be recycled indefinitely without compromising quality. The “Veko” Extreme Sport festival at Voss is commemorating its 20th year. This year's anniversary festival kicks off tomorrow, with something for teenagers, retirees and everyone in between. At Oslo Pride, Norway's largest LGBTQ+ festival, you get to be yourself and enjoy music, art, debate and a spectacular parade.